the youngest child of William and Anne Marie "Tronson" Hesskew with his wife "Dean" had 6 children. 1. WILLIAM ROE3 HESSKEW (WILLIAM ALEXANDER2, MOSES1 HASSKEW) was born October 12, 1870 in Campbellton, Atascosa County, Texas, and died August 20, 1955 in San Antonio, Texas and is buried in Brite Cemetery in Atascosa County, Texas. 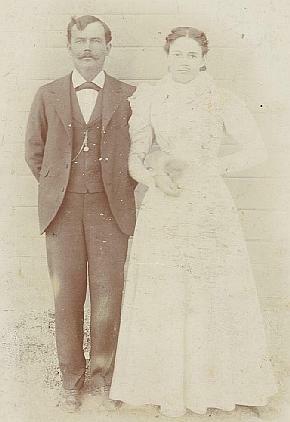 He married ARVERZENE ELIZABETH NEILL 1897, daughter of SAMUEL HOUSTON NEILL. i. DEWEY D.4 HESSKEW, b. August 1898; d. Abt. 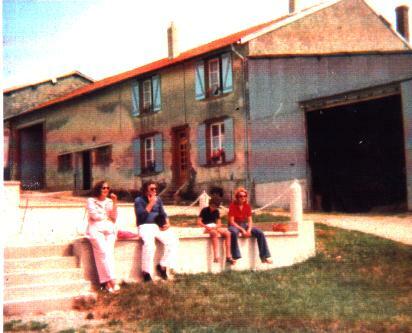 1969; m. Eddie Belle. ii. HATTIE HESTER HESSKEW , b. January 25, 1900, LaCoste , Texas; d. April 21, 1980, San Antonio, Texas , Bexar County; m. WILLIAM POSEY BASKIN. iv. MARY JANE HESSKEW, b. December 09, 1903; d. July 25, 1981, San Antonio, Texas; m. SHERROD O MCCALL. 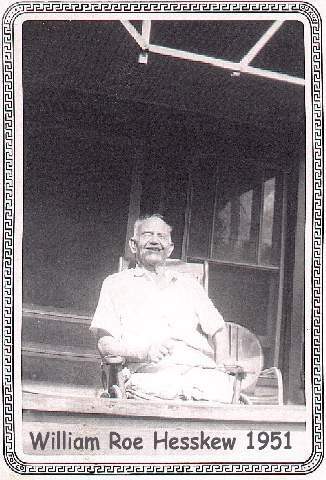 v. LESLIE ALLEN HESSKEW, b. June 16, 1905, Atascosa Co. , Texas; d. July 25, 1906, Atascosa Co. , Texas. vi. LEONARD JACK HESSKEW, b. March 14, 1908, Uvalde, Texas; d. December 22, 1982, Kerrville, Texas; m. MINNIE LEE TRAYLOR, September 01, 1932, San Antonio, TX. i. MARY JANE3 HESSKEW, b. November 02, 1845, Gonzales County, Texas; d. October 23, 1919, Harper, Gillespie County, Texas; m. WILLIAM CARROLL BILLINGS, September 16, 1863, Gonzales County, Texas. ii. HENRY HESSKEW, b. August 04, 18473; d. October 11, 18473.
iii. JAMES ALBERT HESSKEW, b. October 12, 1848, Gonzales County, Texas; d. January 11, 1930, Brite Cemetery in Atascosa County, Texas. Medical Information: James was said to be blind. iv. ELIZABETH SARAH HESSKEW, b. October 31, 1850, Gonzales County, Texas; d. January 11, 19305; m. (1) JOHN J. NEAL; m. (2) G. J. RALEY, April 05, 1883, Atascosa County, Texas6. v. MARTHA ANN HESSKEW, b. November 14, 1852, Gonzales County, Texas; d. April 10, 1923, Eufaula, Alabama; m. WILLIAM STONELL, July 09, 1877, Atascosa Co. , Texas. vi. HARRY M. HESSKEW7, b. 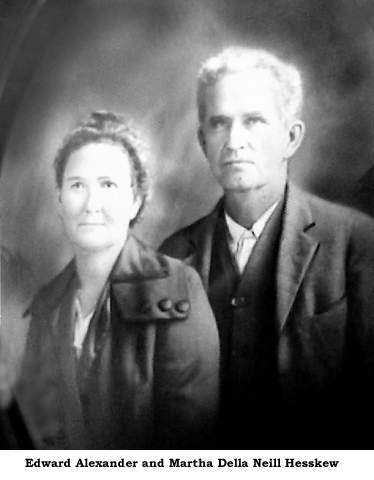 March 30, 1854, Gonzales County, Texas; d. December 07, 1937; m. SUSAN BRISTER, November 09, 1882, Atascosa County. vii. LUCY ELLIOT HESSKEW, b. January 30, 1856, Gonzales County, Texas; d. July 26, 1908.
viii. EDWARD ALEXANDER HESSKEW , b. February 27, 1858, Gonzales County, Texas; d. February 20, 1939, Bexar County Texas; m. MARTHA DELLA NEILL..
ix. JULIA ANN HESSKEW, b. December 09, 1860, Gonzales County, Texas10; d. December 09, 1860, Gonzales County, Texas10. x. JOSEPHINE LUCINDA HESSKEW, b. December 09, 1860, Gonzales County, Texas; d. January 10, 1943, Heard Cemetery, Reagan Wells, Texas; m. BENJAMIN FRANKLIN STEWART11, March 07, 1880, Atascosa County, Texas11. xi. WILLIAM DOLPHUS HESSKEW, b. August 12, 1863; d. August 12, 186312.
xii. 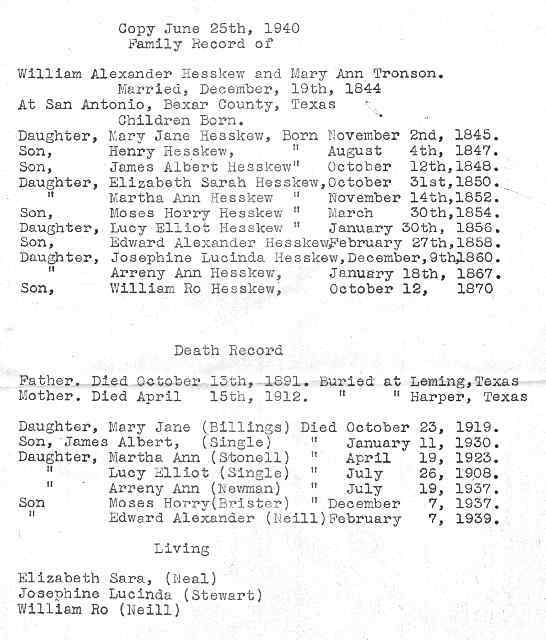 ARRENY ANN HESSKEW, b. January 18, 1867, old San Patricio, San Patricio Co, Texas; d. July 18, 1937, Taft, Texas, San Patricio County; m. SEABORN NEWMAN, November 09, 1882, Atascosa Co., Campbellton Tx. xiii. 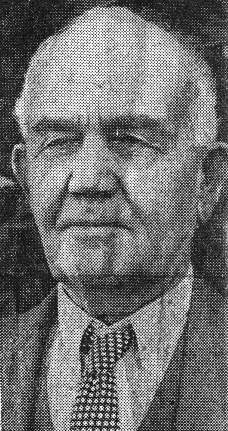 WILLIAM ROE HESSKEW, b. October 12, 1870, Campbellton, Atascosa County, Texas; d. August 20, 1955, San Antonio, Texas and is buried in Brite Cemetery in Atascosa County, Texas; m. ARVERZENE ELIZABETH NEILL, 1897. Subsequent to the above information being correlated I found this information which is supposed to be reflective of the information in the Family Bible.
. William (Bill) Roe Hesskew, 119 Orange Street, who celebrated his 70th birthday Oct. 12, will complete his 49th year of service with the Southern Pacific Railroad Thursday. On that day he will retire. 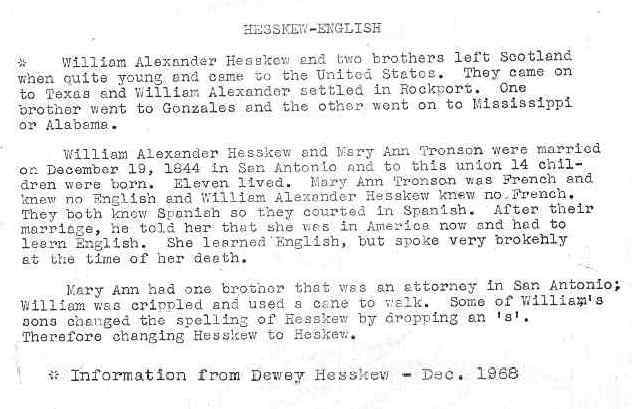 Hesskew, a native of Rockport is credited with being the inventor of an anti-shock crossing frog, which reduced the shock of the railroad cars as they crossed street car beds. Holding a patent on the device, he installed 46 crossing frogs here which were used until buses replaced street cars. 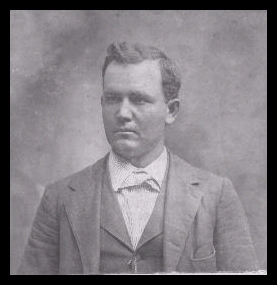 The veteran railroad man began his service with the Southern Pacific in Langtry in 1891 as a "track walker." Since that time he has held nearly every job in the maintenance department from track walker to assistant road master. At present, he is employed on an interlocking switching tower for the company. He has has lived in San Antonio for more than 20 years. RETIRES - Forty-nine years of service with the railroad will be completed by William Roe Hesskew, 70, when he retires Thursday. 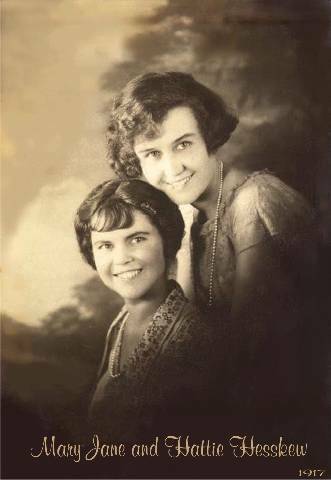 Much of the information we have on the family is as a result of the generosity of Lillian Genevieve "Baskin" Harrison. 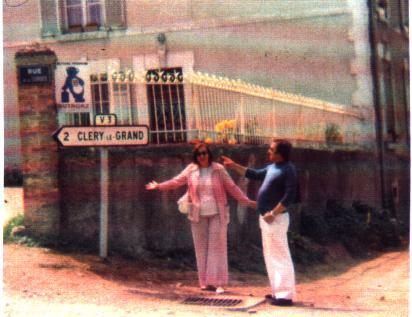 Her love for her grandfather ( William Roe) and the stories he told prompted her to seek out and preserve many invaluable family documents and photos after William's death. I and all family members should be grateful to Lillian for her williness to share these family heirlooms.